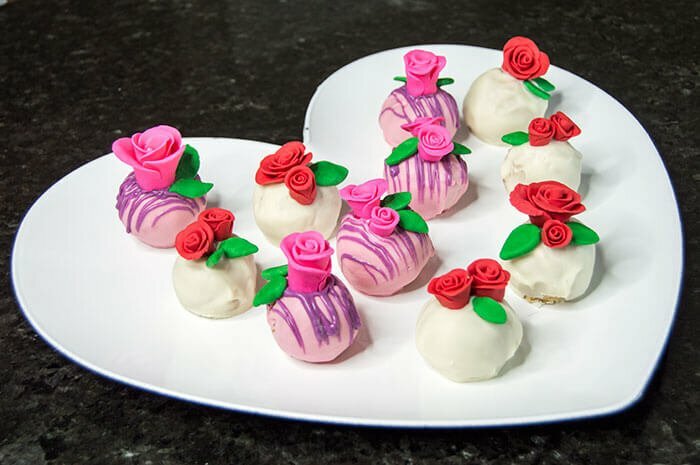 If you want to make a homemade gift for your sweetie this Valentine's day, why not bake them something delicious? 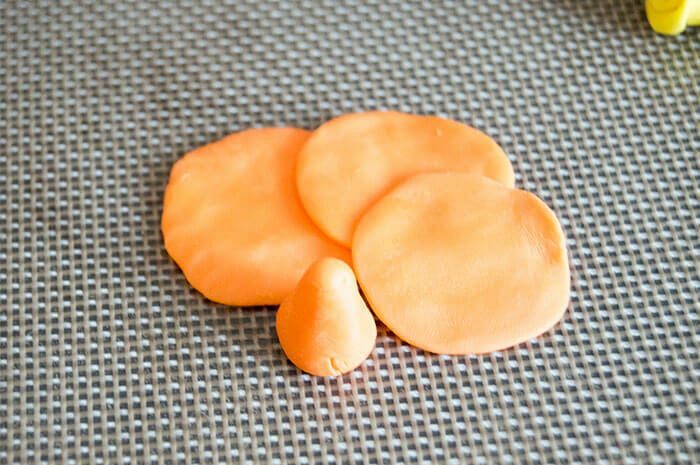 You can easily make truffles from your favorite cake mix and some cream cheese. Also known on my blog as 'cake pops,' I actually used some of my leftover vanilla cake from my strawberry shortcake kabobs. But these truffles are also hiding a secret: a Snickers filled center! I used mini Snickers bars and wrapped them in an even layer of my cake mix. 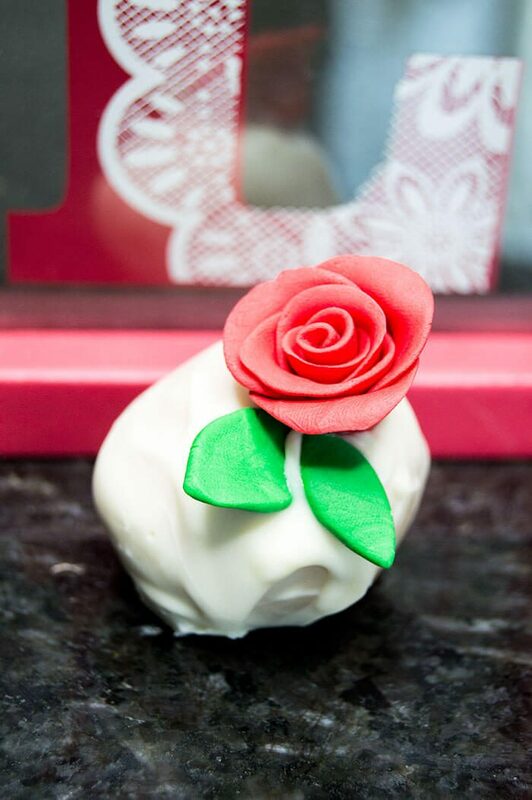 You can use your favorite cake pop recipe or make the roses for another reason entirely! 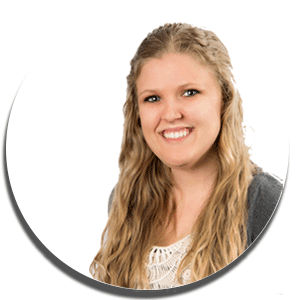 This post focuses mainly on the creation of the roses, so no new recipe today. 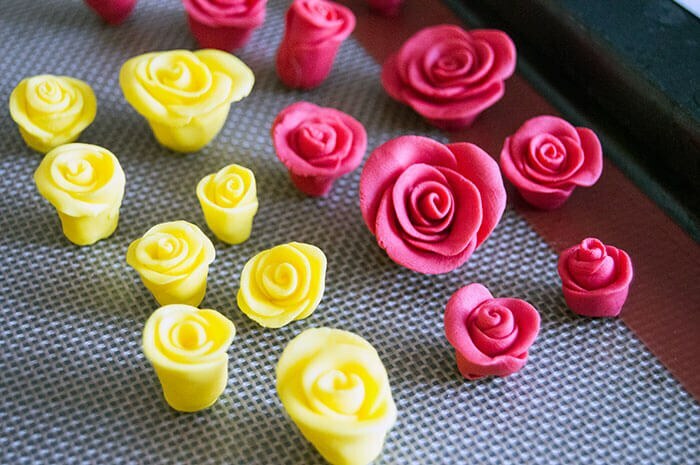 There are several different ways you can make your roses. 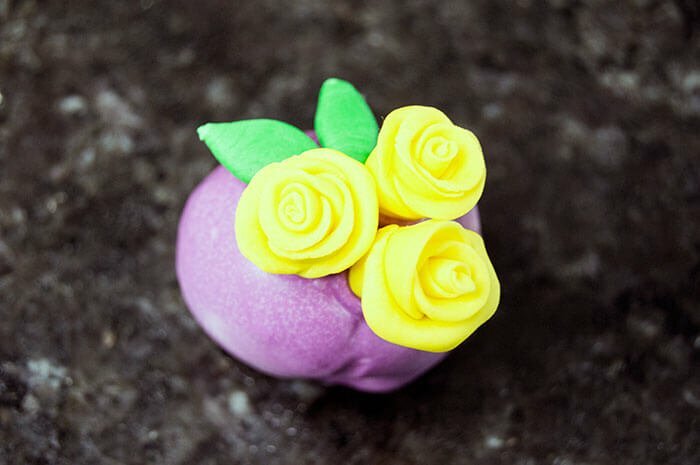 You can either purchase fondant from a cake or craft store (which I did) or you can make your own fondant from scratch if you are feeling adventurous. I used a few different colors of fondant that I had leftover from my Pokemon GO cupcakes. The first method I tried turned out to be my favorite. 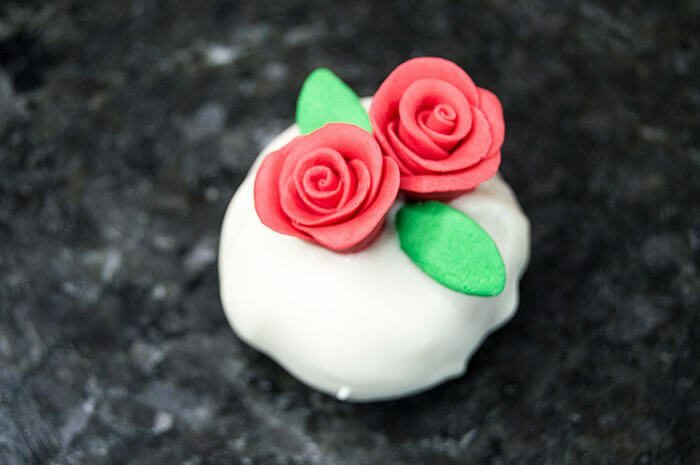 I used a rose red fondant and pinched off little balls that I could flatten between my fingers to be about the size and width of a quarter. 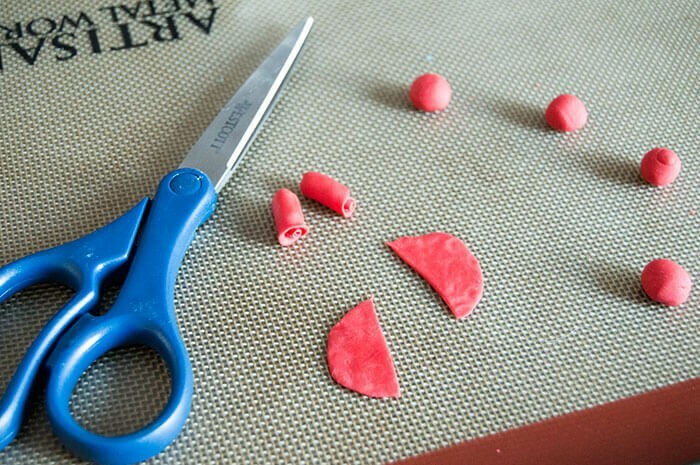 I then cut each circle in half and rolled it into a little cylinder. To make the rest of the petals, I repeated flattening the little balls into circles, cut each in half again, then rolled each half around the cylinder shape. I did this again and again until I was satisfied with the size and shape of the rose. For a realistic look, I pinched the outer petals to be a bit thinner on the edges and curled them back juuuust a tiny bit. 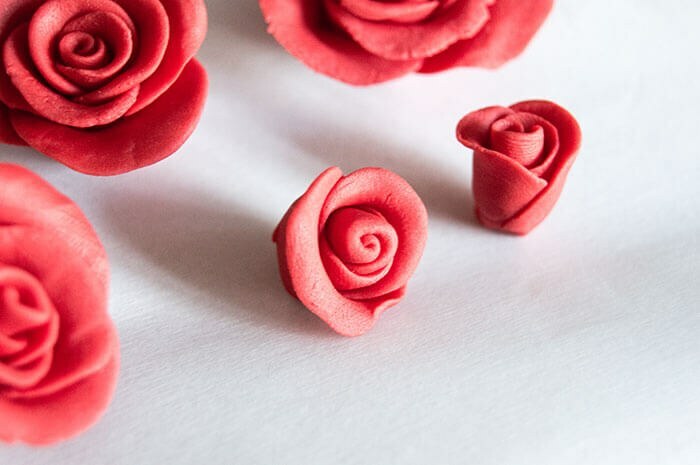 While this method definitely took the longest, I think it achieved the most beautiful roses. 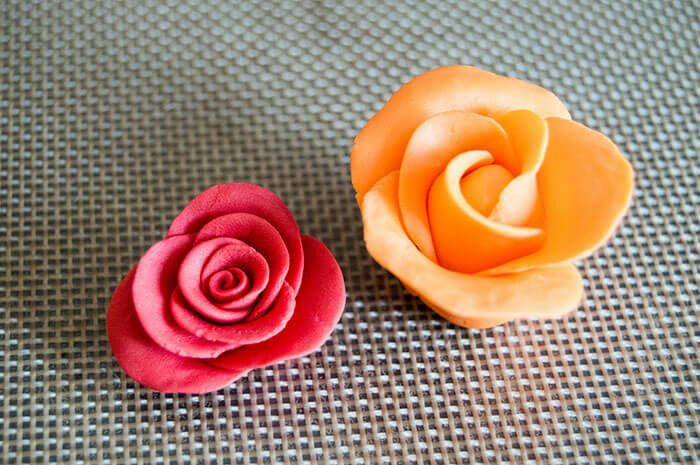 Another way you can make fondant roses - much quicker and simpler than the last method - is to create a small cone shape for the center of the rose, then roll flattened fondant circles around the cone in an overlapping pattern. It was kind of hard to photograph the best way to do this, but essential, you overlap the flattened circles and place where they all intersect into the side of the cone. 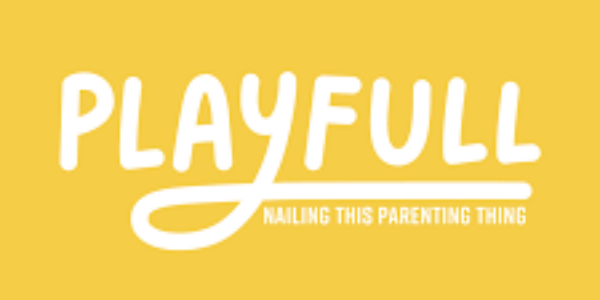 Then tuck the last layer under the first. For a larger flower, create a few more flattened circles and roll them around the petal covered cone. This gives you two layers of petals. 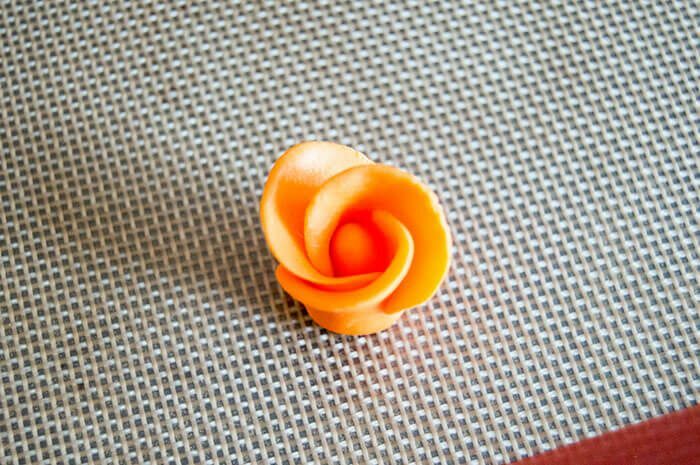 It's a slightly quicker and easier method to individually rolling each center and makes a more tropical looking flower. 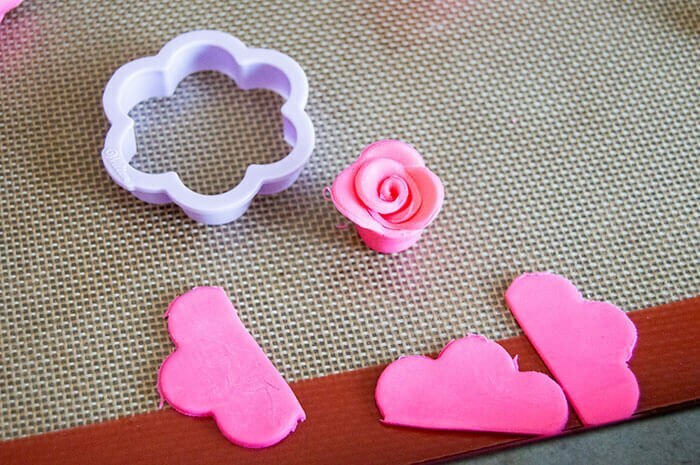 Finally the easiest method is to use a flower shaped cookie cutter. I was dead set on making more roses in the prettiest, simplest way. 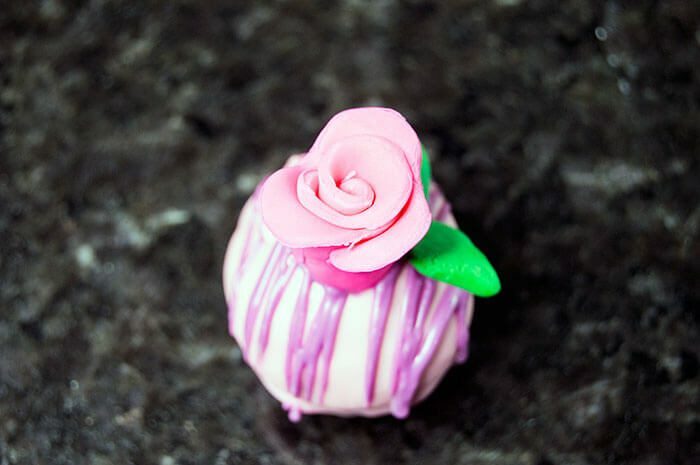 I used the smallest flower shaped cutter, then cut each piece of rolled and cut fondant in half. This method was by far the quickest, as all you need to do from there is roll up the flower! I made sure to roll mine so that the petals didn't line up to create a more realistic appearance, then pinched the edges thinner to stand out further. 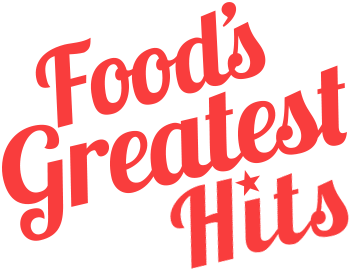 Whatever method you choose to use for these truffles, you are certainly going to win the heart of whomever you make them for! 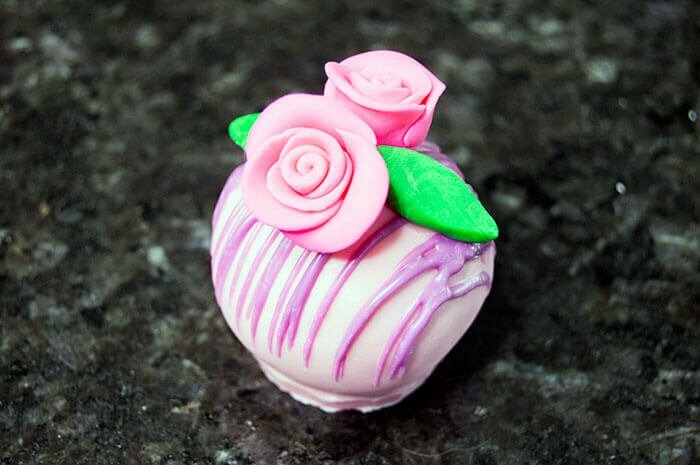 Fondant roses are way easier to make than they look, so you'll appear super talented at baking, to impress your love interest too. 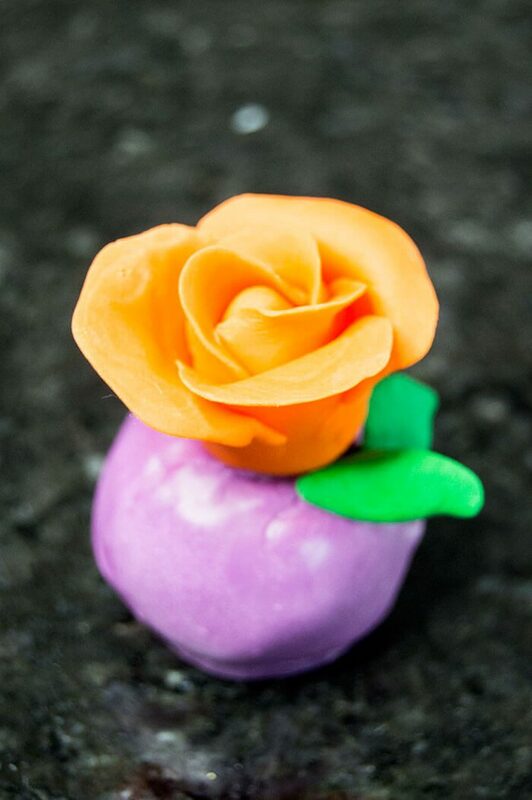 For my truffles, I affixed the roses onto each right after I dipped them in colored candy melts. 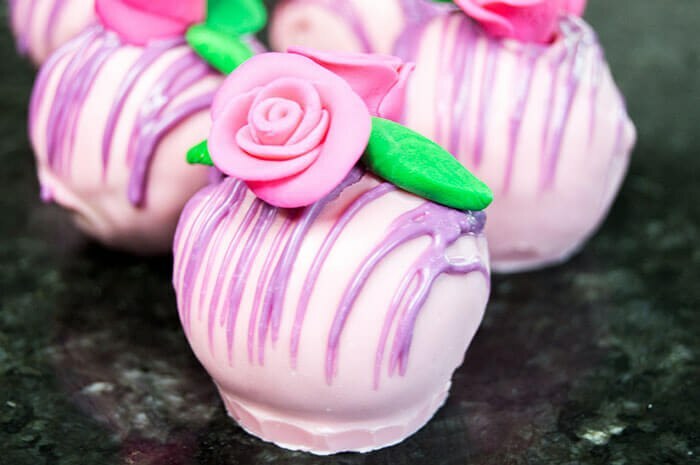 I used a variety of colors and flower combinations to achieve a bouquet effect on each truffle. Or serve as a single rose - and with a kiss!